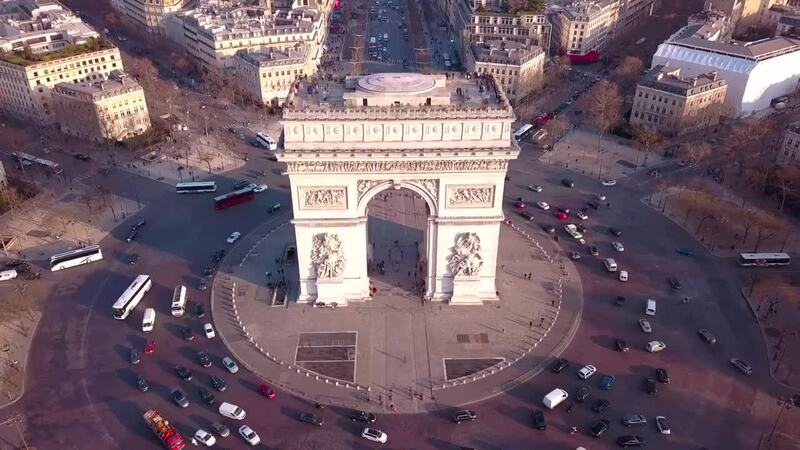 Sphereview created this magnificent bird's eye view of the Arc de Triomphe in central Paris, one of the most iconic sites of Europe. It anchors the western end of the Champs-Élysées, the French capital's most important roadway. It was built as a memorial to France's war dead in the Napoleonic Wars, and its Tomb of the Unknown Soldier is the country's greatest memorial for its World War I dead. The Arc was used as the filming location for a key scene in the 2018 film Mission Impossible: Fallout. Description: The Arc de Triomphe Paris, the most monumental of all triumphal arches, was built between 1806 and 1836. Even though there were many modifications from the original plans, reflecting political changes and power struggles, the Arch still retains the essence of the original concept which was a powerful, unified ensemble. The construction of the Arc de Triomphe in Paris was ordered in 1806 by Napoleon, the French Emperor. Napoleon wanted to honor the Grande Armee, the name of the French army at that time. ... After his Austerlitz victory in 1805, Napoleon said to his soldiers : "You will return home through archs of triumph".